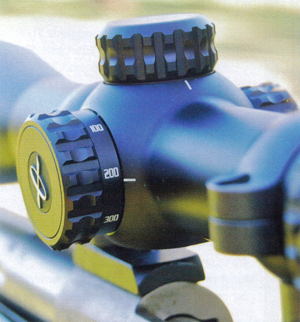 ABOVE : The Burris Veracity 2-10x42 Ballistic E1 FFP reticle. (FFP means "First Focal Plane") with 30mm tube. The new Veracity scopes from Burris have possibly hit the jackpot when it comes to a reticle based ranging system! Why, I hear you ask, well the engineers have realised that the sub tensions between the drop bars change with the power ring when the reticle is in the second focal plane. The second focal plane reticle is more popular because it appears to be the same on all powers. IMAGE RIGHT : The Saddle focus which is used to adjust parallax to zero when shooting at different ranges. This is where I had it adjusted for zero parallax at 100 yards. No there is no fault in the scope as this adjustment can vary with temperature and humidity. The scale is only a rough guide and you must check for parallax every time you shoot at a target if you want maximum accuracy. How did I arrive at this setting? Put the rifle in the sand bags on the bench so it will stay aimed at the target now if you can without touching anything move you eye behind the scope left right and up and down and if you have the parallax adjusted correctly for the target you are shooting at the reticle willremain perfectly still on the target. If it moves adjust the saddle focus wheel a bit and move your eye again taking note of whether the reticle moves more or less, if less adjust a bit more until the reticle stays still. If it moves more wind the turret the other way a bit at a time until the reticle stays still when you move your eye. The slightly down side of "First Focal Plane" scopes is the reticle appears to disappear into the field as the power ring is wound down. This is very evident in our test scope, because the reticle is "glass etched. The Ocular housing showing the fast focus and the power ring set on 10 power. From 2 up to about 5.75 power the reticle appears to float because the bars don't go to the edge of the field. This is why I have been critical of these systems in the past. 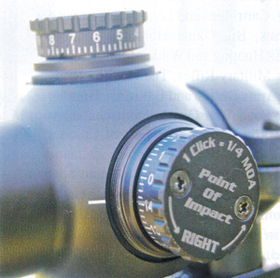 The European scope manufacturers knew this back in the 1950's and put the reticle in the first focal plane. The scope we have to review has 4 drop bars on the reticle under the centre cross. The actual sub tension between these bars remains exactly the same regardless of power. This means if you have the scope set on 2 or 10 power the amount of target between the bars is exactly the same. The thing is, on 2 power you will have trouble ranging anything because the reticle looks to be a long way away. Of course when you have the power ring set on 2 power you are looking for game inside 100 metres. Some of the features we have on this new scope range from Burris are becoming more standard in modern scopes. Parallax adjustment via an ergonomic side focus turret on the left hand side of the turret block. The windage and elevation turrets have very tactile adjusting wheels with the scale under the grip ring able to be zeroed. Both turrets have sturdy protection caps. This scope is reasonably large for a hunting scope which seems to be the way of the future. The ocular housing is 44.5mm in diameter and when focused for me is 102mm long. The power ring is on the front side of the ocular housing and is fluted, which affords a good grip to change the power. There is no location block on the power ring so you have to rely on the stops or look at the scale to know where the power ring is set. This is of much less consequence when using this scope for ranging your target because the sub tensions remain the same regardless of the power. The scope is 345mm (13.625") long and weighs 670 grams (1 lb 8oz). The windage and elevation turrets. Take note of the small notch on the bottom of the scale on the vertical turret between 7 and 8 this notch is used to zero the scale when you have finished sighting in. 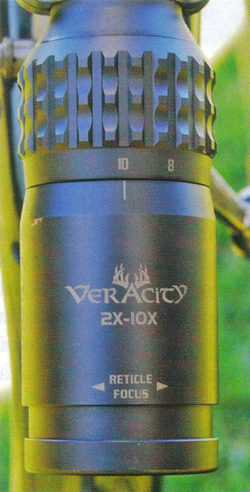 The Burris Veracity was first shot on the Tikka T3x, and shooting in was quickly achieved, and the scope performed well in the field. Now for the G & G scope test regime. The scope was mounted on the black 6mm BR and bore sighted and the second shot was shot number 1 of the 5 shot group in the centre bull of the drop bar test. The group was shot on 10 power and measures 0.4", with shots 2 to 5 going into 0.134" so I think we can say it is extremely capable. Before I did the drop bar test I adjusted the scope so it would shoot below the point of aim using the centre cross. This was done so you would see 3 of the 4 drop bars on one of the G and G target pages. The drop bar test was to show why having the reticle in the first optical plane is so important. The left hand string of shots was shot on 10 power and yours truly forgot which bar I was supposed to be using and fired 2 shots on second drop bar. The shots on the right hand side were not as good on 2 power, and yes the reticle covers the same amount of the target, but when it is all so much smaller it is much harder to acquire the correct aiming point. The centre aiming mark was extremely cluttered on 2 power because of all the busy bits in the centre. Once I got to the second and third drop bars it was a little easier. As you can see the results are close enough to the same that an animal at 350 or 400 yards would be in all sorts of trouble. You must also remember you would not even think of trying to range an animal on 2 power simply because the definition is not good enough. When I did the rest of the G and G test I reckoned the test showing the drop bars would not be complete without doing it on 4 power, so they are to the left of the 10 power line up, and guess what, I stuffed up on the second drop bar again. I was concentrating very hard on a good hold and this confirmed to me why the folk that do a lot of long range shooting dial in their shots with the turrets and don't use the drop bars at all except to judge how much windage or elevation to put on. The 4 and 10 power drop bar tests were done 4 days apart and the light when I did the first test was very dull and what light there was, was from behind the scope. For the shots done on 4 power there was full sun and it was in front of the scope. Just the change in direction and light intensity will give small differences in the point of aim. ABOVE LEFT : The drop bar test on 2, 10 and 4 power and the first group shot after bore sighting. ABOVE RIGHT : The test target with 3 x 5-shot groups shot on 2, 6 and 10 power, I would be pretty confident that anything I were to have a shot at in the , field would be in trouble if the rifle was capable and 1 did my bit regardless of the power setting. The round the target test shows the vertical adjustment is just a little generous over 2" of movement. The horizontal is pretty good. The round the target test I chose 8 clicks so I should gel 2" of movement. Horizontal was spot on and the vertical just erred on the generous side. I did notice the horizontal turret was a little stiff when I got to click 5 and 6 and it was similar coming back to the right. Perhaps this would explain the first of the last 2 shots being not where it should be. The last shot was right between the first 2. The drop bars arc set up for a specific bullet drop compensation out to 600 yards. ABOVE : These 2 images shows the effect of having a "First Focal Plane" reticle when the power ring is used. Note on 2 power how much brighter the field is and the water just in front of the scope. These 2 photos also demonstrate what I often say about a scope being dull on the higher powers. These 2 photos were taken less than 30 seconds apart on the same camera settings. These results are about as good as it gets with a dedicated hunting scope. The group shot on 2 power was just over 0.5". The optics are very sharp and clear edge to edge of the field. Just on its target performance with 20 shots under 0.55" on all powers I would have to recommend you to have a look through the Burris Veracity scopes.